Indonesians push for an increased minimum wage as Thais rally against corruption. More than 100,000 workers have joined a nationwide two-day strike to press for higher wages in Indonesia. Meanwhile, approval of the controversial Amnesty Bill in Thailand’s parliament has sparked a series of protests throughout the country. The October 31 strike in Indonesia was preceded by several weeks of labor actions, factory shutdowns, and union agitation in the country’s industrial centers. The strike gathered thousands of workers in the streets which disrupted production in some cities. Aimed at pressuring the government to raise the minimum wage by 50 percent, the strike was partially successful since it only yielded a 9 percent wage increase for Jakarta workers. Earlier this year, the local government raised the minimum wage by 44 percent. But aside from the pay hike demand, the striking workers are also petitioning for universal healthcare, the abolition of outsourcing or contract employment system especially in state-owned enterprises, and passage of a law to protect domestic workers. The last demand is also being lobbied by human rights groups which have decried the exploitation of domestic workers. There is no law in Indonesia which guarantees the basic rights of domestic workers, such as receiving minimum wage or a weekly day off. The strike was generally peaceful although it once again confirmed that labor unrest is rising in the country. While Indonesian workers were asserting their economic demands on November 1, their Thai neighbors on the other hand were decrying the passage of the Amnesty Bill which would give blanket amnesty to those who committed political offenses since the 2006 coup. After a 19-hour debate and despite the walk-out staged by the opposition, the parliament was able to approve the bill last Friday. The senate will tackle the measure in the next few days. The bill is supposed to promote reconciliation in the country but opposition emerged after it was reported that the amended version of the measure would benefit corrupt politicians and human rights violators. In particular, the opposition said the bill will “whitewash” the crimes of former Prime Minister Thaksin Shinawatra who fled the country after being found guilty of plunder by a local court. Thaksin was deposed by a coup in 2006. His younger sister, Yingluck Shinawatra, is Thailand’s prime minister today. According to Thaksin’s critics, the bill will allow the former leader to return to the country and recover his wealth which was sequestered by the government. Interestingly, the Amnesty Bill is also being rejected by the allies of the government, namely the Red Shirts. The group feels “betrayed” since the bill will also grant amnesty to former Prime Minister Abhisit Vejjajiva (now leader of the Democrat opposition party) who is accused of ordering the bloody crackdown of anti-government protests in 2010. 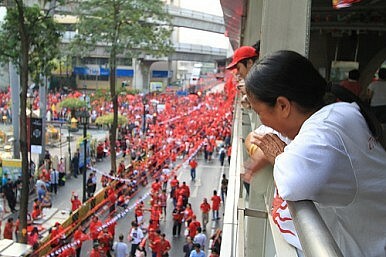 Almost a hundred Red Shirt members died during the violent dispersal in 2010. In other words, the bill is being criticized by both the opposition groups and government supporters. A protest, which attracted 10,000 people, was quickly organized while parliament was debating the measure. Thailand is bracing for bigger protests and intense political conflicts in the coming days as more groups continue to express opposition to the bill. Past demonstrations may give insight into the current Yellow Shirt/Red Shirt clashes.